“Even a Woman Drinks When the Love Sinks” is the title of this lovely Snjezana Komar record. Her ex-boyfriend is probably drinking too to celebrate splitting up with this ogre. You have to wonder if Snjezana had a bad day at the photo shoot or the art director of Jugoton created the most sublime album cover ever. I think it’s both. Strike of genius — whoever was behind this design is the master of the craft. She really looks like a drunken crackwhore. It’s funny that her name actually means “Snowhite” although there is nothing gentle about her. This picture speaks volumes but it is not entirely fair to Snjezana. She is a well regarded folk singer. She doesn’t have the looks but then again, neither does Barbra Streisand. I will make my best to dig up some hot looking artists in the coming weeks to make up for this one. 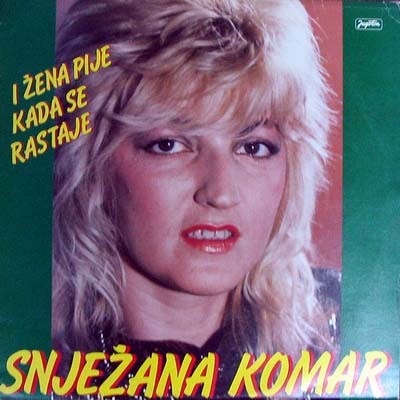 This entry was posted in Records and tagged Bad record covers, bosnia, folk, snjezana komar. Bookmark the permalink.